Those who know the brand and its owner Bill Yao are keenly aware of the care and attention given to every single MK II watch. Mr. Yao has a reputation for being incredibly meticulous, with some of his watches first being assembled in Switzerland, then shipped to MK II’s workshop in Pennsylvania to be disassembled, QC’d, and assembled once more. He would tell you himself that his commitment to quality is often a double-edged sword—it’s great for someone buying a MK II watch, but it’s also the reason why entire lines are often out of stock for long stretches of time. Nevertheless, it’s why MK II boasts such a loyal following in watchdom, and even his detractors would agree that he puts out a damn fine watch. The Hawkinge is MK II’s latest release, and it’s the first in the brand’s burgeoning ready-to-wear collection. That is, the watch is entirely made in Japan (to Mr. Yao’s strict specification, of course), and then shipped back to MK II HQ ready to be sold (there is some in-house QC, but more on that later). As one might expect, this new line comes at a more accessible price point than the rest of MK II’s current catalogue, with the Hawkinge retailing for $595. Before we get to the review, let’s address the elephant in the room. Yes, the Hawkinge is an homage to the Mk. 11, a watch produced by JLC and IWC for the British MoD (read our historical overview here). That alone may end all interest for some of you. Understandably, homage watches can be a sore point among collectors, one that is undoubtedly exacerbated by Canal Street fakes and low-quality reproductions seemingly made from parts out of a bin with little consideration. I too have struggled with my feelings on the matter, but I’ve come to the conclusion that thoughtfully executed homage watches—and MK II watches are certainly that—allow collectors of all means to enjoy certain styles of watches they may otherwise be unable to afford. That’s especially true of hard-to-find vintage military pieces like the Mk. 11, a watch whose design technically belongs to the MoD, and not to IWC of JLC who simply built the watches following military guidelines. Purists may scoff, but then again, these watches aren’t for them. I should also note the Hawkinge pays homage to another watch from MK II’s own history—the QUAD10, which was MK II’s first branded watch. So in a way, the Hawkinge is also an homage to an homage. That’s sure to get someone’s blood boiling. With that out of the way, let’s take a closer look at the watch itself. The case of the Hawkinge comes in at 37.8mm wide (excluding the crown), 48.5mm from lug-to-lug, and a height of 12.75mm. On the numbers alone, one might conclude that the watch has overly long lugs and that it’s too thick relative to the diameter. The reality couldn’t be further from the truth. The case is ideally proportioned both off and on the wrist. The case back dips a bit into the wrist, negating some of the height, and the lugs feature a rather dramatic curve, which helps plant the watch securely against the wrist. The case is 316L stainless steel with a fine brushed finish. This includes the case back, which features concentric brushing, and the head of the hearty 6x4mm crown, which is left unsigned. The crown screws down and is fitted with two gaskets to aid with water resistance, which is 10 ATMs (100 meters). The crown operation is incredibly smooth and its size allows for a comfortable grip. The case back features six notches along its perimeter, as well as some of the specs etched below each notch. The lugs are 18mm wide, which feels right and harmonious with the proportions of the case, and they’re drilled. The movement is fitted within a Delrin holder. Though some might see this as a negative, Delrin is actually a very durable long-polymer thermoplastic with loads of industrial applications. In fact, Speedmasters fitted with 1861 movements feature brake parts made of Delrin. With the Hawkinge, the Delrin movement holder aids in the absorption of shocks, and it contributes to the overall lighter weight of the watch. Being that this is an homage to the Mk. 11, I should note that the case has been upsized a bit, which to me feels like the right call. Despite the slight inflation, the watch still gives off the small-and-chunky vibe that the original is known to have. Aesthetically, the case is an amalgam of cues, with a profile closer to that of a JLC Mk. 11, and a case back more closely resembling that of an IWC. Overall, it’s really well executed. 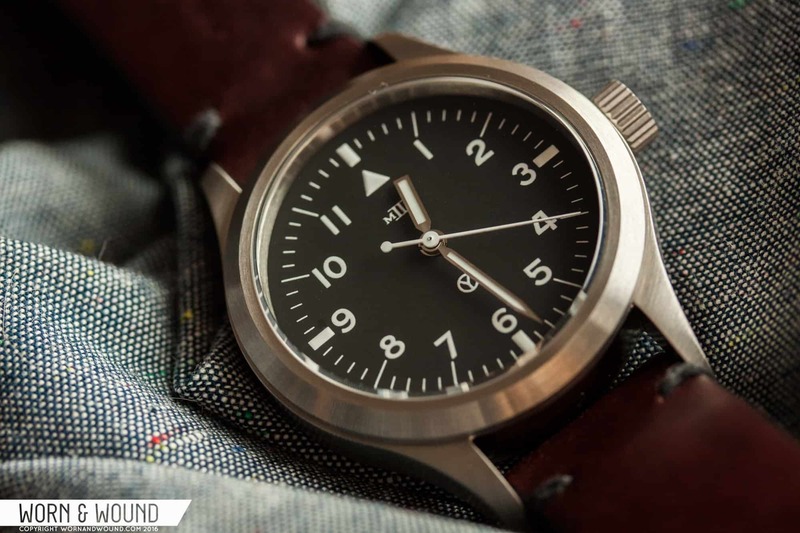 The dial is a nearly identical recreation of the later RAF-issued “Circle-T” variants. It’s matte black with white printed markings and serif-free Arabic numerals, except for the 12 o’clock position where there’s a triangle. There are markers to denote every minute, with large rectangles at 15, 30, 45, and 60, thin long lines at all other intervals of five, and shorter thin lines for the remaining minutes. The MK II logo is printed below the 12 o’clock marker, and a Circle Y (for Yao), a riff on the Circle T (which was used to denote tritium), is positioned right above six. There are currently two dial variants: date and no-date. The handset borrows from some later Mk. 11 models as well as future iterations of the Mark series from IWC. The iconic squared-off hour hand and sword minute hand offer a great, understated look that is immediately legible; there’s no confusing the two, even at a glance. The second hand is a long needle with a small counterweight, and it’s painted white. There’s an immediate clarity to the dial, largely thanks to the spartan military design, but one that is also aided by some of the finer details Mr. Yao incorporated into the piece. The hands are plated, polished, and finished with a slightly curved surface. Unlike hands that are completely flat, curved hands better pick up the light, which means they won’t “black out” the way flat hands do at certain angles when facing a dark surface. It’s a seemingly small detail, but one that packs quite a punch on the wrist and goes a long way toward readability. Another detail aiding dial clarity is the double domed sapphire crystal, which means that both sides of the crystal are convex. It’s a costlier type of crystal to manufacture, but it’s also one with some very obvious benefits. Curving both sides of a crystal results in significantly less optical distortion of the dial, especially when the watch is viewed at more extreme angles. Double domed sapphire glass is more common among costlier mid-to-high range watches, so it’s a real treat to see it here. Furthermore, the underside is coated with AR, resulting in a clearer view of the dial. Nighttime visibility is another thing worth noting. Under low light conditions, the contrast dial and reflective hands are very easy to read. In the dark, the BGW9 Super LumiNova—which is present on the hour and minute hands, the four rectangular markers, and the triangle at 12—performs adequately. It’s no torch, but I’ve worn the watch to bed and have had no issue reading it in the middle of the night. At the heart of the watch is the SII NE15, otherwise known as Seiko’s 6r15 caliber. It’s a solid, Japanese-made movement that hacks, hand winds, and features a quick-set date at three. It’s also capable of impressive accuracy with some calibration, and it’s used in many of Seiko’s mid-range lines. The Seiko factory regulates the movement to three positions, but MK II goes the extra mile and tests the movement to six positions in-house. The results are included with the certificate of guarantee. As previously mentioned, the watch wears extremely well. It’s an incredibly discrete piece, and one that’s light, too (80 grams). The watch can be purchased with one of two straps: a leather two-piece, or a Maratac-branded nylon mil-strap. The leather strap is quite nice. It’s straight cut and thick, and it’s comfortable right out of the box. The leather is vegetable tanned and given the light tannage, it should age beautifully over time. Of course, the Hawkinge is ideally paired with a nylon mil-strap, and that’s primarily how I’ve worn the watch–on a grey/olive Phoenix-branded strap. I’ve also tried it on several of our new Model 2 Premium straps and cordovan single-pass straps. They’ve all worked great. The MK II Hawkinge is secured and delivered in a pelican-style hard case with an integrated handle and internal foam padding. There are three large cutouts that can be used to store watches, so this isn’t your typical throwaway packaging. There’s some utility here, and I appreciate MK II going above and beyond and providing their customers with something that’s actually practical. Beyond that, there are two extra sets of spring bars (one set is shoulderless), a spring bar tool, and a two-sheet certificate of guarantee with pertinent information about the watch and the aforementioned timing test results. Before I wrap up my thoughts, I should first say that I am a huge fan of the Mk. 11. Aesthetically, it’s a perfect watch. It’s a watch that, given the means, I would love to own. But the reality is I am unlikely to have one in my possession anytime soon, but to be perfectly frank, that’s okay, because the Hawkinge more than fills that void. MK II really nailed it with their latest, and from the proportions to the overall aesthetic, it’s a watch that does right by its historical counterpart. But beyond the homage aspect, the Hawkinge is a great watch in its own right. It’s simple, legible, and it has all the right specs and hardware to ensure long-term wear. It’s seldom left my wrist since we got it in for review, and I think that’s saying something.